Whether you're decorating for Christmas or making these Christmas origami projects with your family on the holiday, these 10 Christmas origami projects have you covered! The great thing about origami is that you can keep them for years when looked after properly. You can bring these projects out each year, and they will remind you of the fun you had making them together with your friends and family! These cute origami Santas are great to make with your kids. You can give them different expressions and decorate them with pens, stickers, and pompoms! These super easy-to-make origami Christmas trees can be used to make Christmas cards, hung up as tree ornaments, as a paper garland or stand on their own or with a toy nativity set. This beautiful origami 'Fox Box,' made from three sheets of square paper, is one of the easier models to start with. You can make it using different colored sheets of paper, textured paper or metallic paper. These origami boxes can be used as gift boxes or hung up as pretty Christmas tree ornaments. These cute little origami 'lucky stars' are easy (and addictive) to make! They are made using strips of paper. You can cut strips of Christmas wrapping paper or use colored printer paper for these. They look great threaded onto strings and hung up around the house or on the Christmas tree. You can also stick these onto cards or use one as the star to stick on the top of an origami Christmas tree. If you made some origami lucky stars, you can display them in what looks like a giant lucky star! This origami star dish is made from one sheet of square paper that's first cut into a pentagon. Don't worry–it's easier than you might think. These pretty origami star bowls made with thick or textured paper make great servings bowls for snacks. This 'Origami Stellated Octahedron' is made from one sheet of square paper. What makes this origami star fun is that you fold the model and then inflate it by blowing into it! These origami stars look wonderful hanging on the Christmas tree or if you make a few, they can be displayed in bowls. This pattern was designed by Sam Ciulla. These origami hex stars are made using 6 strips of paper. They are quite easy to make. They look wonderful hanging down from the ceiling or strung up on a garland. This pattern was designed by Maria Sinayskaya. If you're up for a challenge, these origami Christmas crackers are a great choice! They actually open in the middle and could be used instead of store-bought Christmas crackers. There would be no bang, but your guests would most likely want to keep the cracker for themselves! 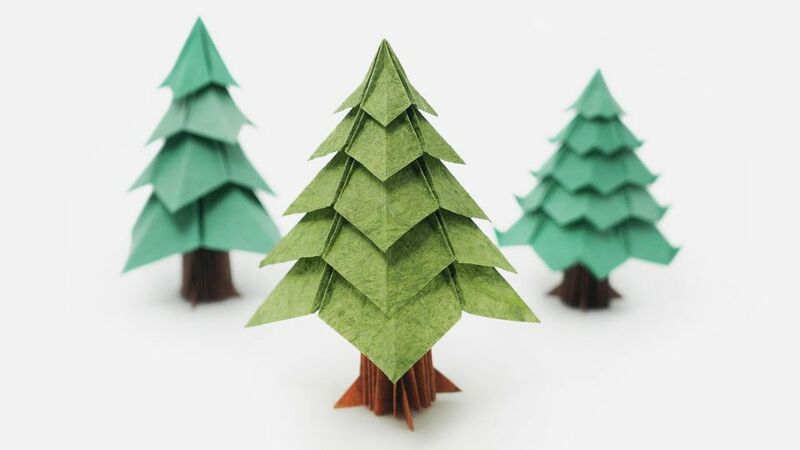 This origami tree is made from 6 sheets of square paper. This model is an intermediate level project, so if you've never folded anything before, it would be best to fold some of the models previously mentioned first! This origami sakura star is a more advanced level origami project. This model is a great choice if you have folded a few intermediate origami projects previously. This origami star flower would make a lovely Christmas tree decoration, or if you made it from large paper, it could be the Christmas tree star! This pattern was designed by Ali Bahmani.